If jeweller art of Tatars belongs exclusively to professionals who were engaged in this business, as experts the needlework area is considered long since an original art of the Tatar family woman. Tatars the big needlewomen: cloths, scarfs and towels of their work are very beautiful. Tatars learn to sewing, embroidery ichigies and tubeteika with all to the Asian taste patterns, ornaments. Tatars love needlework, embroider onuchas, towels, bibs, weave cloths, know morocco work, embroider with gold and silver. 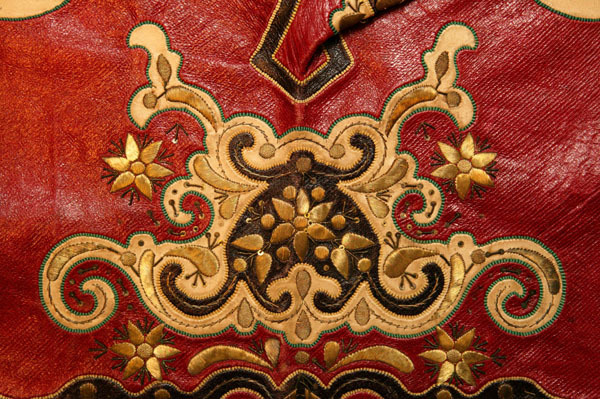 Embroideries generally are executed by chain stitch, and the pattern composition consists of motives of a vegetative kingdom, embroider with silks, gold, silver and worsted. Favourite tones are: green, yellow, dark blue and red colours. Prayful rugs - namazliks, embroidered worsted in very juicy and bright tones of impressionist colour are beautiful also. Since the Volga Bulgarians the widespread theme of the flower bouquet connected with the image of a steppe bush of "a life tree" and symbolising a life source has reached us. The motive of a bird or the bird's feather since ancient times was a symbol of the sun, light at Turkis. The tulip one of the first spring colours and a favourite element in the Tatar ornament, was a revival symbol.